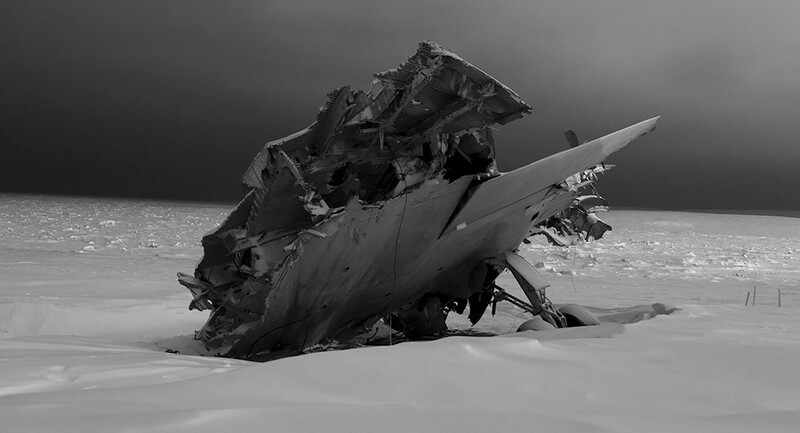 War as a Problem of Foreknowledge | continent. such persons can enter the gates of excellence. The costs of prosecuting a war are egregious and fatiguing. There will be years of antagonisms developed between the belligerents with discontent, anxiety, and hostility saturating all strata of those societies. The states will redirect their means of life-sustaining activities toward generating the most death and mayhem across as many actors as possible. It will culminate in a single battle, but the process of victory-making will have been much greater, and the ensuing precarious period of stability will be riddled with opportunities for discordant social relations. Given these long-term social harms that accompany the prosecutions of wars, the sixth century BCE philosopher Sunzi argued that it is inhumane for generals and the states leadership to engage in such military actions without the use of advance intelligence. This foreknowledge, as Roger T. Ames calls it, can only be educed through the proper understanding of people. The sagely ruler and superior commander conquers their enemies through the careful managing of personnel and the cultivation and orchestration of loyalties across an imperceptible web of social networks. War is not only a problem of logistics and the prudent deployment of force multipliers—it can be that—but the winning of wars is a problem of knowledge-making. Situating the practice of warfare in this manner, we see a cultural orientation present in the ancient Chinese context that insisted upon the marriage of the epistemic with the normative. In this orientation, to know something is to also understand how to maximize the utility of the subject in question, as well as engage with it in a manner that produces the most desirable outcome across a range of social dynamics. The manner in which one prosecutes war, the way one comports oneself when engaging in the solemn rituals of social life, one's demeanor when crossing the street—each of these are holographic entry points into one's character, revealing the essence of who one is. Charles Stankievech has developed a body of work that resonates with this. Stankievech's focus upon twentieth century surveillance technologies suggests a shift of perspective for those thinking about the social impact of the last century's media. There might be some who are tempted to announce that the definitive shift in contemporary societies today arises from the receding primacy of broadcast television and the ascendancy of the asynchronous communication typified by the media platforms that harness ubiquitous computing. This comparison might suggest that the societies of broadcast television experienced a common hallucination: someone in the United States, alive during the Kennedy assassination, could tell you where they were when they learned about it, or where they watched the attack on the World Trade Center in 2001. It was a communal experience where human attention was harnessed toward what the broadcasters beamed at those audiences. But what Stankievech reveals through his body of works is that this interpretation has the wrong emphasis. The more significant object mediating human societies is not the screen upon which humans focus their eyes, rather the more remarkable thing is the making invisible of remote controls. I only had initially a lunar and lucid vision, and so I plucked for myself the instant before it died and perpetually dies. "The artist is an antenna"
The Geodesic Radome is the synecdoche of modern warfare post-WWII—an architecture that distributes its structural forces through a framework formally related to the communication network it defends. 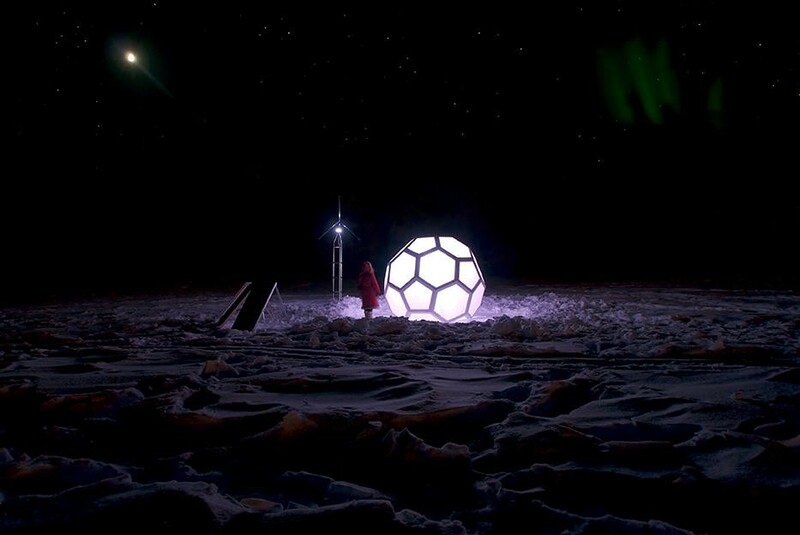 Echoing Paul Virilio who argued in 1975 “the bunker is the last theatrical gesture in the endgame of Occidental military history”, the geodesic radome is the first architectural gesture in the play of Network Centric Warfare (NCW). With the onset of the Cold War, foreign policy shifted into game theory where communication of ideologies between players functioned as much as propaganda as defence asset—such as the strategy of M.A.D (Mutually Assured Destruction). In order for these strategies to be implemented new infrastructures, including the integrated air defense systems SAGE and DEW, were rapidly developed by the US Military, private corporations like IBM and Western Electric and research centres such as Massachusetts Institute for Technology’s Lincoln Labs. A joint venture between the US Air Force and the Royal Canadian Air Force, the DEW Line (or Distant Early Warning Line which became operational in 1957) was a network of remote radar and communication outposts extending across the high Arctic from Alaska, across Canada, to Denmark's Greenland. 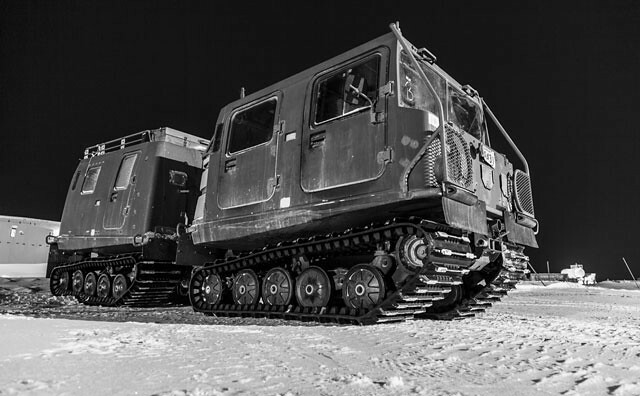 Always on alert for USSR bombers flying over the icecap to deliver nuclear warheads, the outposts utilised new technological developments in the fields of radar and automatic signal detection. 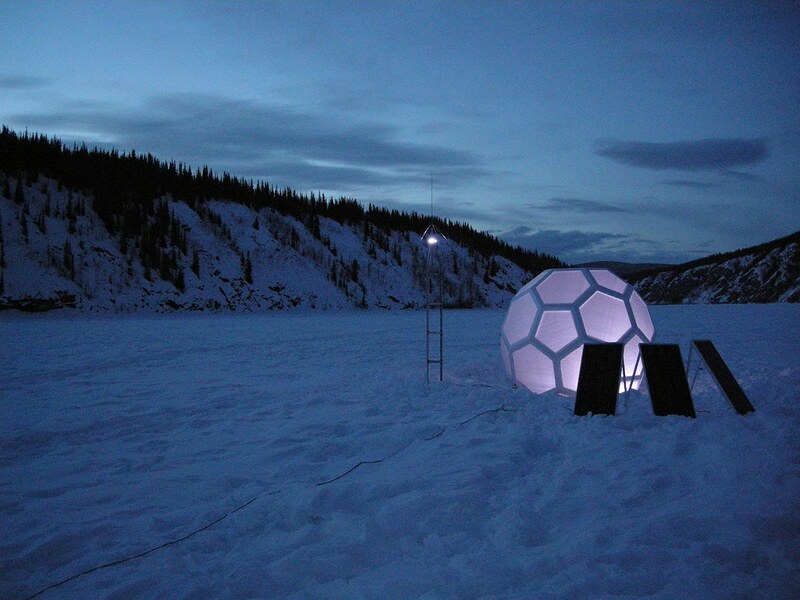 In order to protect these electronics from the harsh environment of the Arctic, Lincoln Labs collaborated with Buckminster Fuller to design the rigid geodesic radome—an advancement from Buckminster’s earlier steel struts design to an electromagnetically invisible shell needed for antennas. 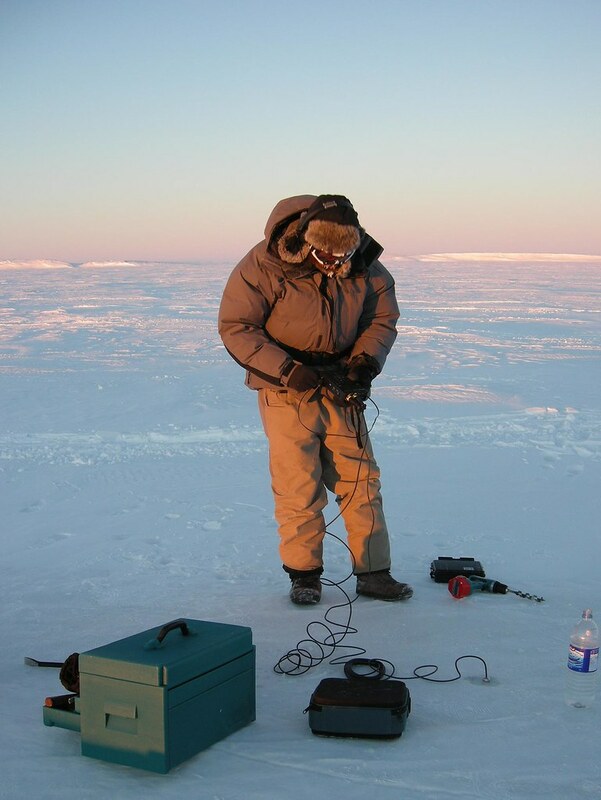 Today the same regions invested in the Arctic during the Cold War (Canada, US, Russia, Norway, and Denmark) are again turning their attention towards the North driven this time by melting temperatures and greater pressure for natural resource extraction resulting in a renewed confrontation that could be called the “Warm War.” The Cold War might have ended in a successful negotiation over the frozen “nomad/no man’s” landscape of the Arctic, but will the current battle over natural resources and sovereignty in a rapidly melting world share the same quiet fate? A germane topic today, sustainability is not just a trend concerning a particular architectural design but the infrastructure and networks between nation states that will determine not only what—but who—is sustained in the future. 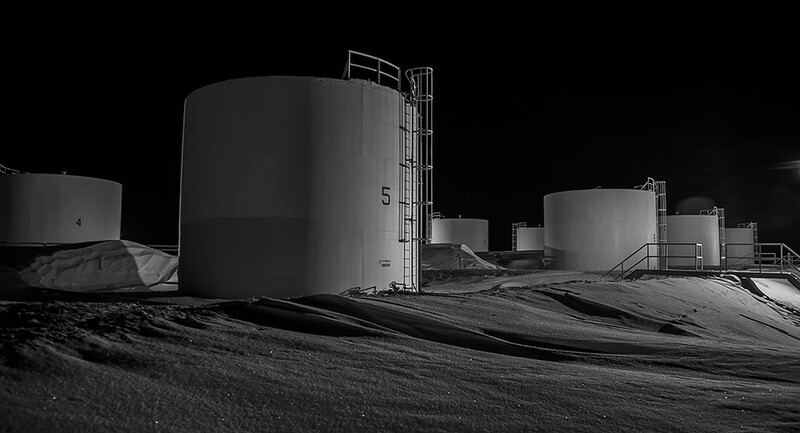 The DEW Project revisits the issue of boundaries—both in regards to the environment and sovereignty—while observing how communication technology plays a pivotal role in the definition and delivery of such ideologies. The series of weapons tests had fused the sand in layers, and the pseudo-geological strata condensed the brief epochs, microseconds in duration, of thermonuclear time. Typically the islands inverted the geologist’s maxim, The key to the past lies in islands was a fossil of time future, its bunkers and blockhouses illustrating the principle that the fossil record of life was one of armour and the exoskeleton. Entry points into the future=Levels in a spinal landscape=zones of significant time. —J.G. Ballard. The Terminal Beach. 1964. “The centre cannot hold,” writes W. B. Yeats while reflecting on the spiritual ruins of World War I. An archeology of military outposts across the twentieth century unearths a typology of early warning systems that trace the vector of a centre spinning into a “widening gyre.” Such an archeology outlines a series of architectural forms built to function on the edges of civilizations, concretizing a shift from a geometry focused on a centre to a topology of connections. 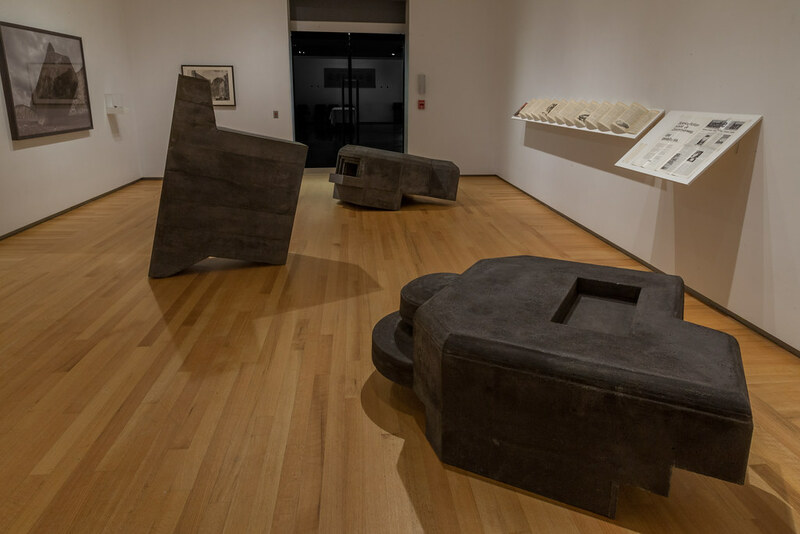 Moving forward through time, traces remain in the form of a trinity of outposts based on three different types of modalities: the sonic in World War I, the visual in World War II, and the electromagnetic in the Cold War. 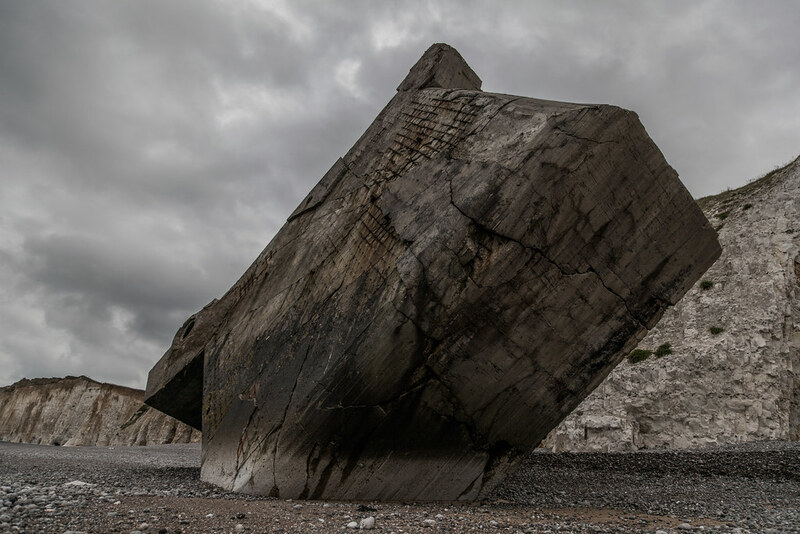 Monument as Ruin (2015), which encapsulates the first two modalities, concludes a three-part research treatise on military architecture in which I have methodologically moved backward in time. 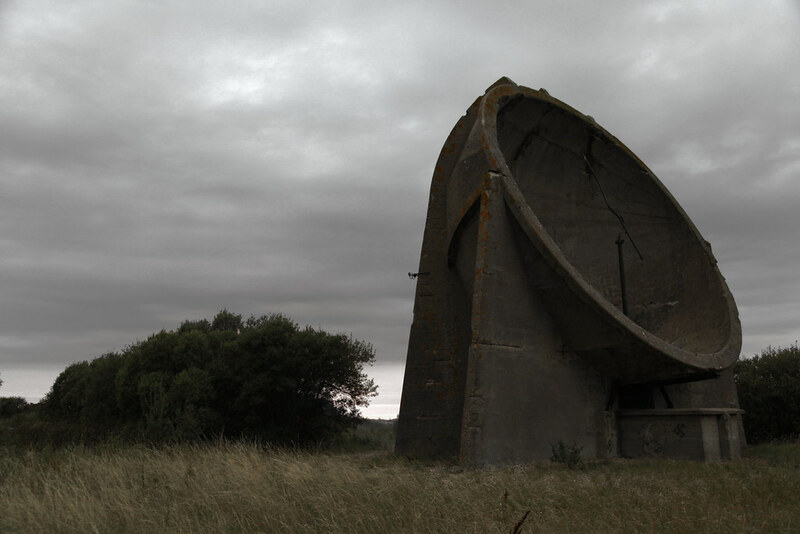 In the initial project, my fieldwork Distant Early Warning (2009) engaged with the embedded landscape and the history of electromagnetic warfare in the latter half of the twentieth century. Particularly, Distant Early Warning investigated how the unique formal overlapping of the functional and structural elements of Buckminster Fuller’s geodesic radome foreshadowed networked warfare as an extension of game theory. 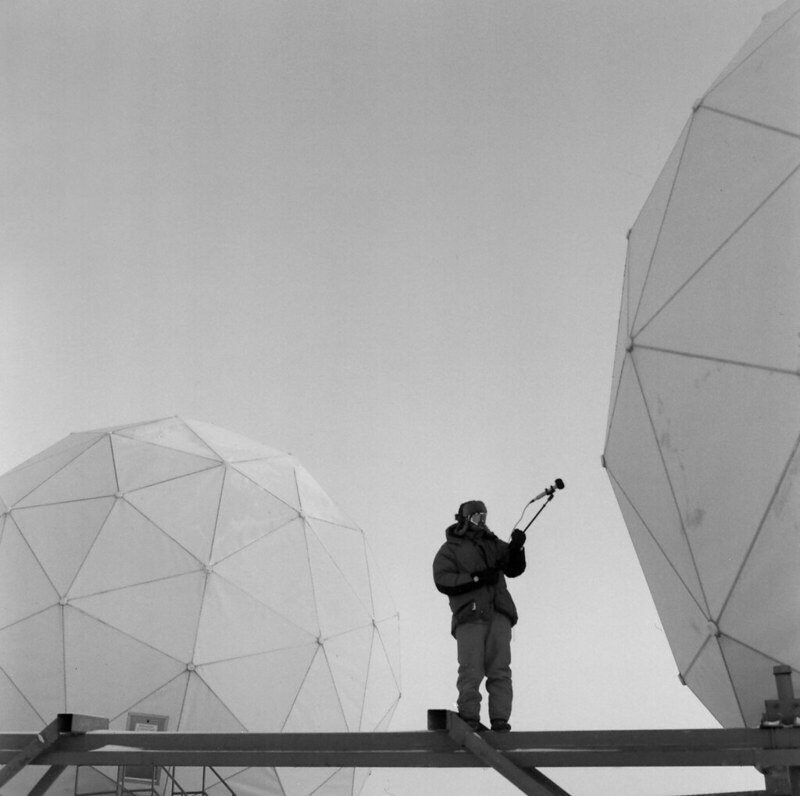 The project focused on the geodesic radomes of the Arctic radar surveillance stations as the synecdoche of the Cold War’s development of networked warfare—an architecture that distributes its structural forces through a framework formally related to the communication network connecting the architecture. 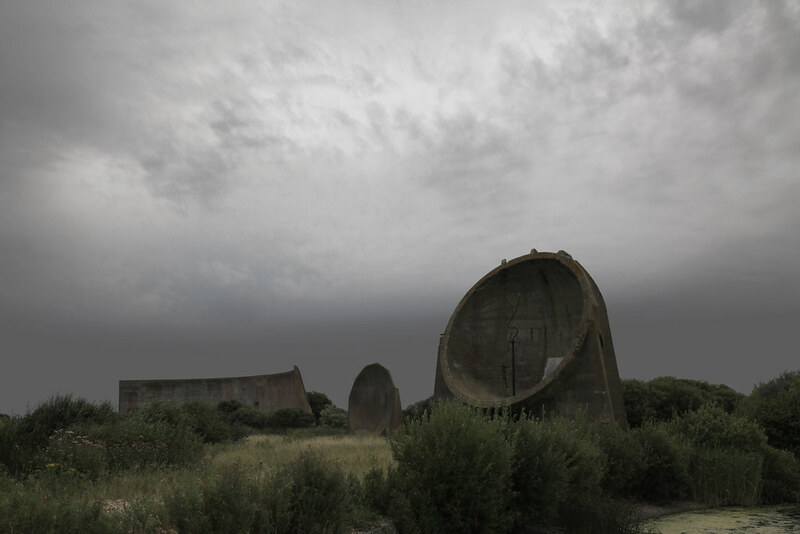 The current project, Monument as Ruin, retraces this methodology even farther back by focusing attention on two more, similarly extreme examples of military outposts but from before the Cold War: the centre of gravity in the Atlantikwall comprised of cement Nazi bunkers in World War II and the focus of the paraboloid in British experiments with cement sonic reflectors starting at the end of World War I. Seen as a completed series, the trilogy of twentieth century military outposts—due to their extreme design and construction—reveal the shift in values of a society: from a modernist centre to a contemporary decentralization. The trajectory of modern military outposts unfolds according to the introduction of the third dimension of warfare—the development of flight that subsequently led to the addition of airplanes to the battlefield. Ancient warfare was at first one-dimensional (or odological, as in linear pathways) as military strategy followed the line of rivers and coastlines from port to port. Advancements in cartography and mobilization established a two-dimensional understanding of war with blocks of territory to conquer and defend. Three-dimensional warfare started to treat the earth, ocean and air as spaces of penetration. In this modern theatre two elements became important upon introducing aircraft: attack limitations were based on geodetic vectors of distance and not so much the landscape's topography, and moreover, the speed of the enemy’s attack became exponentially faster. In order to defend against this new threat, Britain experimented with large cement paraboloid forms designed to collect and amplify the sound of noisy airplane engines. Built on the coast of the southeastern United Kingdom as a bulwark against continental invasion, the monoliths’ large concave dishes faced the English Channel, angled slightly upward into the clouds. 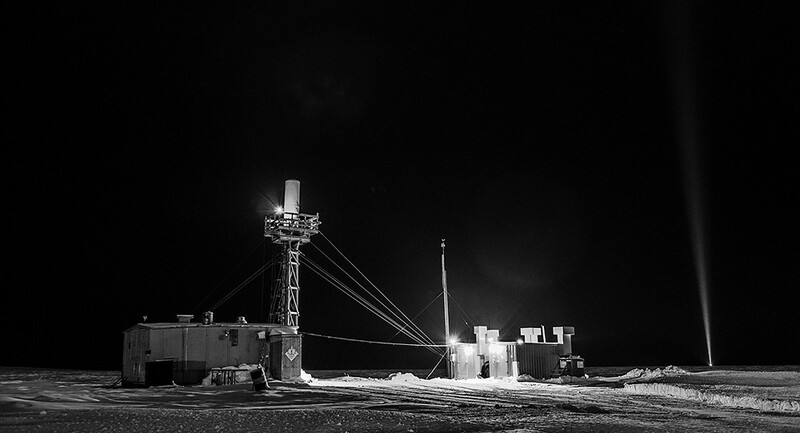 According to fundamental physics, sound waves were expected to travel across the open ocean/landscape and bounce off the large reflective surface of the cement dish to be collected at a single point, the focus of the dish, and thus amplify the signal. 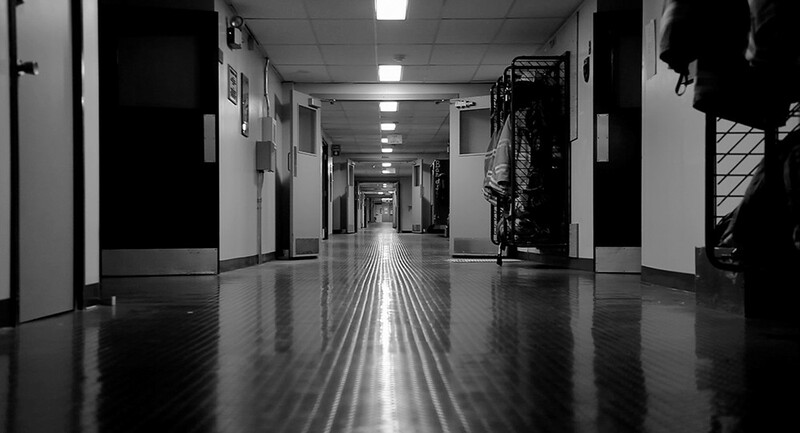 A listener would be positioned at this exact point with either a stethoscope or a microphone, aiming to pick out an incoming bogey. Monumental in size, the structures were immovable, and, for most of the paraboloids, so was the resulting focus point for listening (experiments with later and larger reflectors involved moving the listener or positioning several listeners to attempt a direction-finding technique using spherical rather than paraboloid concaves). 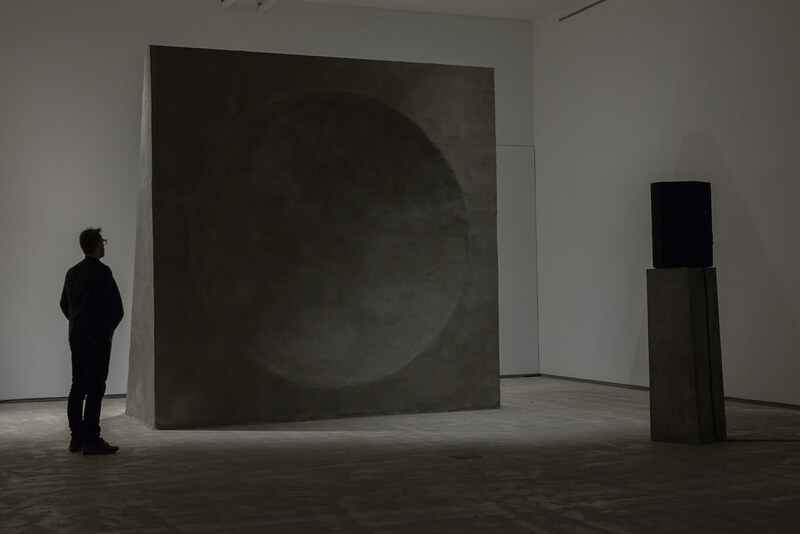 Ultimately, the cement forms were a failure as they received too wide a bandwidth of sonic information: from ocean waves and traffic to wildlife and the elusive aircraft. The invention of radar, with its narrowed focus on metallic objects, quickly replaced these experiments before they were of any practical use, other than the establishment of a network protocol between outposts that was transferred to the Chain Home system. (Ironically, the first radar experiments by the British included bouncing a BBC radio signal off a bomber—a direct transfer from sound to electromagnetic information). Today, the paraboloids stand guard over a Tarkovskian “Zone” of overgrown marshes, fields and ruins. We no longer know if these monolithic sentinels are still listening. 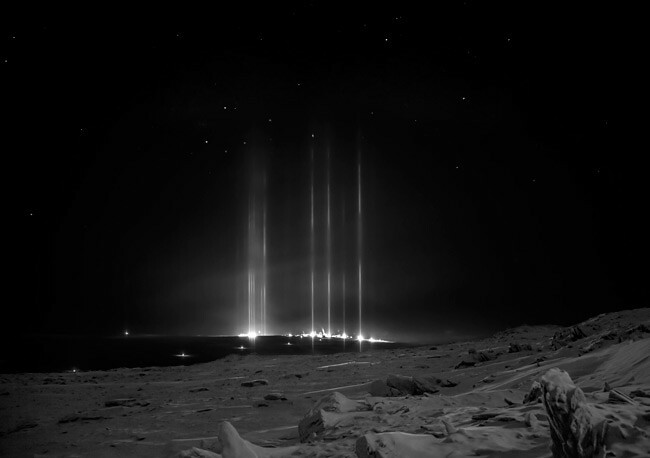 Perhaps, like the monolith of Stanley Kubrick’s 2001: A Space Odyssey, they are waiting to send out a cosmic signal at the destined geological period, although in our parallel universe, not at the advent of galactic Homo sapiens but after the Anthropocene, when the Earth has cleansed itself of the dangerous mutations of humans. Across the Channel a few decades later, the centre shifted from the focus of the paraboloid to the centre of gravity in bunker architecture. 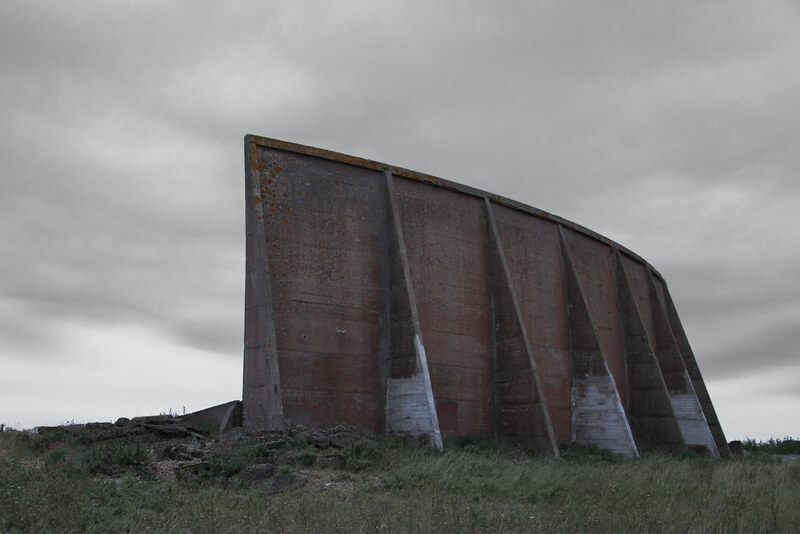 In his seminal exhibition and resulting book from 1975, Bunker Archeology, Paul Virilio points out that the uniqueness of the Atlantikwall’s cement forms consisted in their structural integrity derived not from a foundation but rather from their centre of mass. 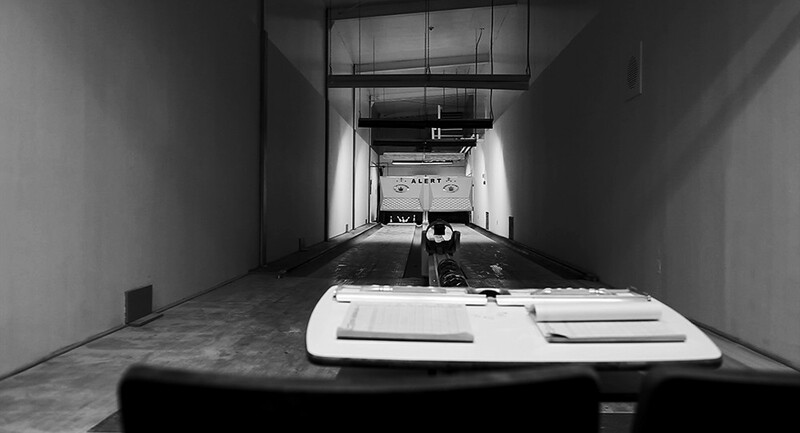 In contrast to traditional buildings constructed on pads or pillars aligning themselves with the Earth’s gravitational forces, what philosophers Gilles Deleuze and Félix Guattari would call “stratified space,” the bunker was a single cast object with deflecting curves and without windows—more like a monad. Consequently, if the earth was blown away under the bunker, instead of the building conventionally collapsing, it simply rolled upon the radius of its centre of gravity. 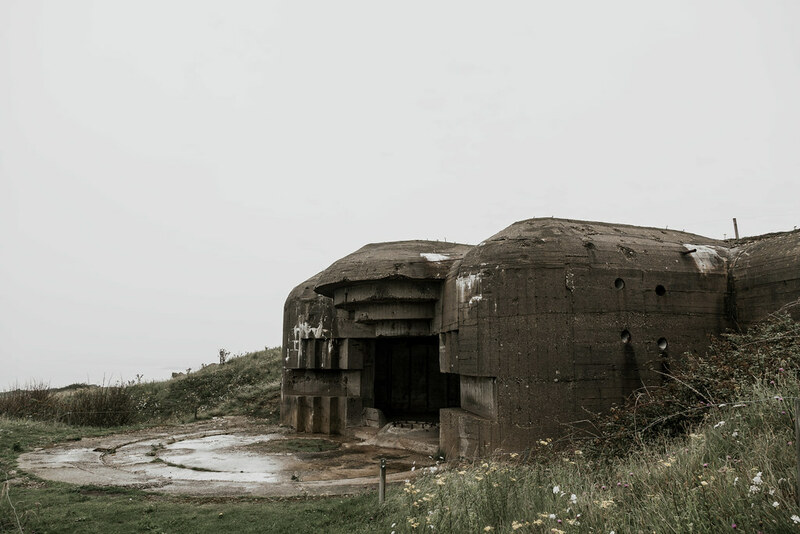 With this movement, the concept of the centre in military architecture makes a slight shift: away from paraboloids with stationary centres of structure and perception, to bunkers that could tolerate movement and remain operational. 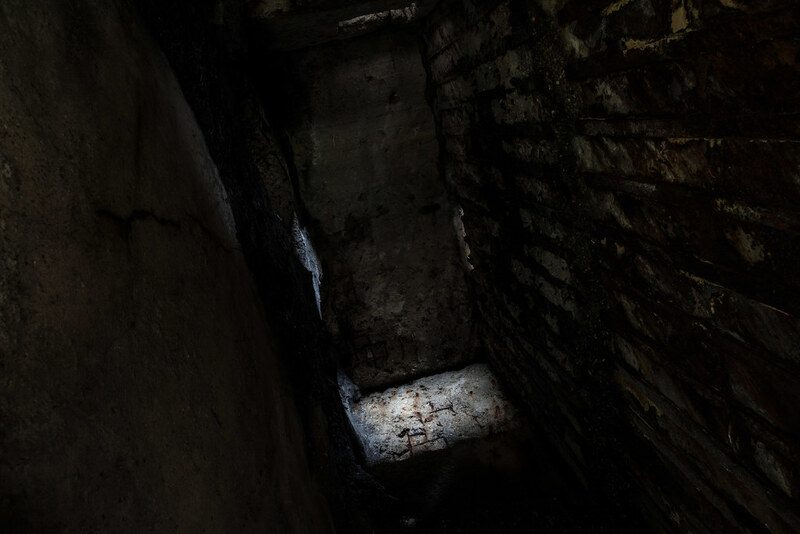 Whether they moved in the middle of battle among humans or in the battle against time itself, the bunker embodies the antithesis of artist Robert Smithson’s notion of architecture—instead of entropic time burying a shed, here the Earth itself has weathered away to reveal a cosmic starship. What remains is an evil relic of colonialism—either from an empire in the twentieth century or perhaps from when alien life first came to this planet millions of years ago.